Soon Sadness becomes a manageable part of the little girl’s day to day life and then just as suddenly as he arrived, he disappears. 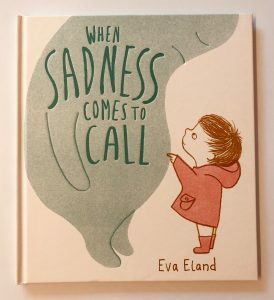 This poignant and beautifully illustrated book does a wonderful job of showing children the transient nature of big emotions like sadness and why it is always best to address your feelings. The visual representation of sadness is so lovely that Ivy always says she wants to cuddle him and make him feel better whenever we read this story. I also like that he is shown as a visitor, thus assuring children that his presence is only every temporary.